Wilbur O. Jensen, age 94, of Adams, Wisconsin died Sunday, April 7, 2019, at Villa Pines Living Center in Friendship, Wisconsin. Memorial services will be 11:00 a.m. on Friday, April 12, 2019, at Roseberry’s Funeral Home in Friendship. Pastor Terri Skildum will officiate. Interment will be at the East Arkdale Cemetery. Visitation will be 9:00 a.m. until the time of service on Friday at Roseberry’s Funeral Home. Wilbur was born August 26, 1924, in Arkdale, Wisconsin a son of Ottar and Doris Jensen. He was baptized and confirmed at Trinity Lutheran Church. He was an Adams County Resident all his life farming on the family farm in Arkdale until retiring in 1988 and moving to Adams. Wilbur married Jeannette Kingsley Kobs on May 31, 1957, at Trinity Lutheran Church in Arkdale. He was a member of Trinity Lutheran Church. 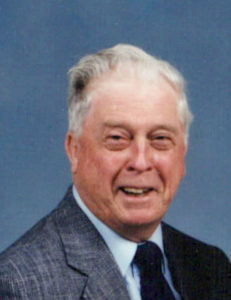 He served on the Board of directors of Adams Co-Op for many years. After moving to Adams, he became a council member for the city of Adams. Wilbur was preceded in death by his parents, Ottar & Doris Jensen; wife Jeannette, granddaughter, Denise Kobs; brother, Clifford (Verna) Jensen; sisters, Evelyn (Joe) Balija, Gladys (Chester) Harris, Ethel (Bernie) Bucek & Mildred (Oscar) Moe; three infant brothers, and brother-in-law Fritz Riese. He is survived by his 3 sons, David (Marcella) Kobs, Dennis (Bonnie) Kobs, and Robert Jensen; six grandchildren, Christopher, Justin, Chad, Lisa, Madeline & Logan, and sister, Norma Riese. He is further survived by great-grandchildren, nieces, nephews, relatives, and friends. In lieu of flowers, donations may be made to the Arkdale Trinity Lutheran Church. Condolences for the family of Wilbur Jensen.I had the pleasure of knowing Wilbur from the community center.We missed him when he wasn’t coming every day but I didn’t know he was at Villa Pines. R.I.P. Wilbur. My deepest condolences to you Rooster. I enjoyed stopping over and visiting with you and your folks. This is where we had our first taste of Billy Beer in the late 70’s. Another visit had a dead weasel on the porch of your house. and won! Many more enjoyable memories of Wilbur. So sorry for your loss. He was a well known man. Prayers to you and your family. So sorry for your loss. Take with you the wonderful memories of your father and know he is now at peace. This time of year he is probably in the field planting crops. He was a wonderful quiet man who always seemed to have a smile on his face. My thoughts and prayers are with Wilburs entire family. Sending our condolences to the family, so sorry for your loss. Our thoughts, prayers and sympathies go out to all of Wilbur’s family at this sad and difficult time. Wilbur was a truly sweet man and he will be missed by many. May God, Family and Friends bring all of you comfort…..God Bless your family. Our sympathy to Wilbur’s family at this sad time. Sorry to hear about your dad rob. Thoughts and prayers are with all of you during this time. Wilbur was one of the greatest men I’ve had the pleasure and privilege to know! I loved listening to his stories, gardening together, grilling out, exchanging e-mail jokes and so much more! I was blessed having him be a part of my life! I will miss you Wilbur! Last time I saw him he was spryly climbing the ladder in the old barn, trying to coax my kids up there with him while mom and I looked on a tad horrified. He had taken us over for a tour of the old farm, and was saying re-roofing that barn was going to be next on the list when they sold it. Sparkly sense of humor, always friendly to kids, and a great guy. May his memory be a blessing. Robby and Family I am so sad to hear of Wilbur’s passing. He was a pretty great guy and I am glad I got to know him when I was Mayor. He was a wealth of history and other fun information, We will remember the day we all went to Wollershime Winery for the first release of their Bandy. What a fun time. He said it was one of the best days he had in a long time! Don McGowan and I send our condolences and prayers during this time. Our thoughts and prayers are with you at this time of great sorrow. Remember all the good times. God bless you and your family. Thoughts and prayers Dennis & Bonnie and the rest of family~~sorry for your loss. Although it’s been many many yrs, i recall him coming to my aid when stuck in snow. I always heard good things of him-may he rest in peace. So sorry. He was like a grandpa I never had growing up. So sorry that Wilbur passed away. I will truely miss him.He was a wonderful friend and neighbor. Jennette and Wilbur will finally be together. My prayers are with you.Robbie and families. Thoughts and prayers for all of Wilbur’s family, I was fortunate to know him my whole life. A very nice man and many great memories! JP and I send our heartfelt condolences. Wilbur will be missed. Love hearing JP’s stories of him. He was genuinely a great guy. Sending our sincerest sympathies on the loss of your Father. Wilbur was a wonderful man who will be missed. I took care of him at Villa Pines. Our deepest condolences to the family of Wilbur. Prayers during this difficult. Our fortunate you all were to have him so long in your lives. Mike and Sue Moran. sending sincere condolences to Wilbur’s family, thinking of you and prayers to the entire family as they get through this difficult time, Wilbur was truly one of a kind, with his quiet demeanor, and not a bad word about anyone, he will be missed by all who knew him. So sorry for your loss Rob. Hugs and prayers to you and your family. So sorry for your loss. Wilbur was a fun guy with great humor. Served on city committee’s with him over the years. Our deepest sympathies Rooster. He was a great man who lived a long and distinguished life. It was a pleasure to have known him. So sorry to hear about Wilbur’s passing, what a fun man, God bless. My thoughts and prayers are with you Robbie, David and Dennis and extended family’s on your loss of Wilbur. He was a great guy and a good friend of my parents . They played many many hours of cards over the years! Dear Dob & Family, so very Sorrg for the news of Wibur passing away. Thiughts & Prayers too yours Family. Danirl T Morrow, a.k.a Shark Love you Roost. So sorry for your loss David Dennis and Rob and family’s. Farewell to one of the good guys, a life well lived. Sincere sympathy to Wilbur’s family. So sorry ton hear about your dad’s passing Rob. You have been through a lot in the last year. I continue to pray for you. Especially now. The days and years have passed quickly. I recall your dad’s quiet nature and joyous smile. Condolences to Dennis, Robbie, and the family for your loss. Wilbur will be missed by all who had the honor of knowing him. So sorry for your families loss. Thinking of you during this difficult time. Sending 🙏🏼. We’re so sorry for your loss. Sending thoughts and prayers for comfort and peace. So sorry for your lost Rob. Keeping you and your family in my thoughts and prayers. Hugs. Sorry to hear of Wilbur’s passing….my thoughts and prayers are with the family. Sorry to here Rob. Thinking of you and your family. My sincere condolences to Wilbur’s family. What a long wonderful life he had.